patara made from pure brass metal. patara is exclusively designed for home interior and can be put any where in hotels,malls, showrooms,offices,musiums. two handles of pan shape os given to lock patari gives it purely traditional looks which made up from pure brass casting. it is laminated so no need of polish regularly it looks same for a so long time. 15inches * 9inches * 12 inches. patari requires very little maintenance as mandir is pretreated to prevent termite and rust. this requires only wiping with soft cotton cloth occasionally. handicrafts are masterpieces in themselves and depict the varied art forms of our country. We supply grocery in FCL/ LCL cargoes as per our clients requirements. The gamut of Indian Handicraft Items we supply is due to the sound infrastructure facilities available. We have a large production capacity that is being aided by different hand tools and machinery provided to our artisans and sculptors. Our professionals carve out these artefacts, figurines and paintings with extreme dexterity to make each of the items a true masterpiece. They make sure that all the details have been incorporated with exquisite detailing and finish. Quality in terms of the raw material used and the flawlessness of the products is never compromised. 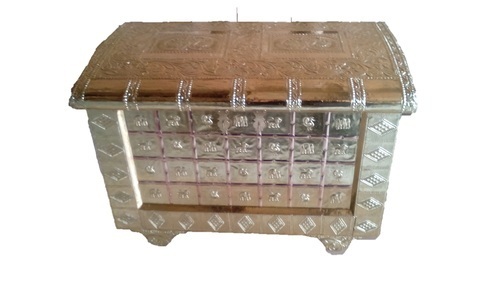 Owing to such factors, we have become a trusted name amongst the clients for authentic Indian handicraft products. Our organisation has gained a positive market reputation under the aegis of our mentor, 'Mr. Dineshbhsi makwana '. He has been associated in this industry for many years and is passionate about Indian handicrafts and art works. His interest in these traditional artefacts is apparent from the dedication with which he is leading the organisation. His in-depth industry knowledge and strong business acumen have helped us spread our business around the globe.